Art seems to fit most comfortably into labels, Contemporary, Expressionism, Landscape, Portrait, Folk Art, Naïve, Primitive, and Outsider. The labels go on and on. I’ve never been certain whether the art fits into the labels, or that collectors prefer that it does. 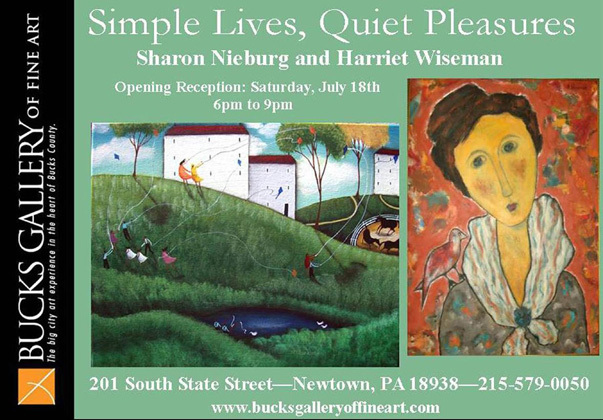 The two artists on display July 18th-August 14th at the Bucks Gallery of Fine Art in Newtown, Harriet Wiseman and Sharon Nieburg, are true originals. Neither of them fit neatly into the categories that have been assigned to them by the art world. Harriet best describes her work as self-taught, as opposed to Outsider Art, though her work is often exhibited under the Outsider Art Category. Her art presents something of a dichotomy, at once sophisticated, yet simplistic in its theme. It wouldn’t be difficult to categorize her work among the Outsider artists. Yet to do so, isn’t quite accurate. Harriet herself, is vibrant, intellectual, verbal and sophisticated, attributes not normally ascribed to Outsider artists. Sharon Nieburg’s work is Folk Art at its most sophisticated level. She creates little worlds on her canvasses, fully realized, simple yet stylized. She refuses to be categorized into the standard themes of American Folk Art, and incorporates her vision to include a world view of folk art, capturing elements of Haitian, South American, and at times, Asian folk art influences. Harriet Wiseman, a Philadelphia painter, is married to a prominent physician. She began to paint at the suggestion of a therapist whom she saw at a difficult time in her life after her children had grown and left home. Depressed, but not sure why, art therapy allowed her a release, a way to give form and substance to long held fears and pain rooted in a difficult childhood. The home she shares with her husband Ken, is a testament to the remarkable journey her art has taken in the last 15 years as painting after painting hang on walls, up staircases, rest on easels. Their collection of art and sculpture is large, beautiful and intensely personal. Both Harriet and Ken share a passion for collecting. Harriet is open, outgoing, and utterly honest about the difficulties in her life that led her to her most remarkable career. She is charming, modest, and grateful for a gift that allows her to express her deep felt emotions. Her supportive husband, an internist in Philadelphia, introduced himself to me simply as “the husband of the artist.” He supports her efforts fully. He cooks while she paints, and he frames all of her pieces in his own small studio, that rivals a frame shop. She paints on board, and antique book covers. The subject matter is mostly women, families, engaged in everyday events and activities. They are the women from her childhood, sometimes happy, sometimes serious, and always compelling. Elaborate attire hats and jewelry reveal themselves in many paintings, a commentary on times and places gone by as well Harriet’s background as a jewelry designer. Her painting style is unique, beginning as splashes and blotches of colors across the surface of her painting, which she gradually remove or enlarge and shape, until the painting she envisions emerge in sophisticated color palettes. The long oval faces of the women are similar to the artist’s own and contribute to a strong feeling that you are looking inside this painter’s soul. Sharon Nieburg considers herself an ethnic folk artist, though she is Eurasian, her paintings focus primarily on black folk art. A graduate of Penn State, Sharon has a degree in graphic design, and, spent part of her childhood in and around Bucks County, though; she has lived in California for most of her adult life. After completing several highly successful shows, and a developing a devoted group of collectors nationally, she took a hiatus from painting to pursue her passion for jewelry making. Two years ago, she suffered from a pancreatic tumor that almost took her life. Fortunately, the tumor was benign, though the recovery was not. The pain both physical and emotional, as well as the months of recuperation were intensely difficult, and though her physical recovery has been slow but steady, her emotional recovery has taken longer. She speaks sparingly of that time in her life, focusing rather only on the effect her illness has had in returning her to the world of painting as her form of self-expression and release. Sharon states it simply, “I paint to express my emotions”. Her art is an attempt to explore color, movement and rhythm. The paintings, acrylic on canvas, reflect s a quiet, world of the past, utilizing mostly simple images, African American themes and primitive styles Charming vignettes of activities and events, painted in clean bold colors and pared down images. Her elongated human forms create a grace and fluidity in her paintings and hint subtly at an artist who has intensely studied her craft. They are both innocent and evocative, depending upon her mood. She credits Rousseau, and Gauguin as well as Spanish and Haitian art as her inspiration. Reviewers have called her paintings “soulful and comforting.” She has been genetically blessed to have been born into an extremely talented art family. Her mother Chiyomi Taneike Longo and her stepfather Al Longo are illustrious abstract expressionists. Chiyomi’s paintings have been seen in movies such as She’s Just Not That Into You, and Mr. and Mrs. Smith, and her father, Gordon Neiburg, is an award winning photographer whose work graces the pages of most of the areas magazines and newspapers. 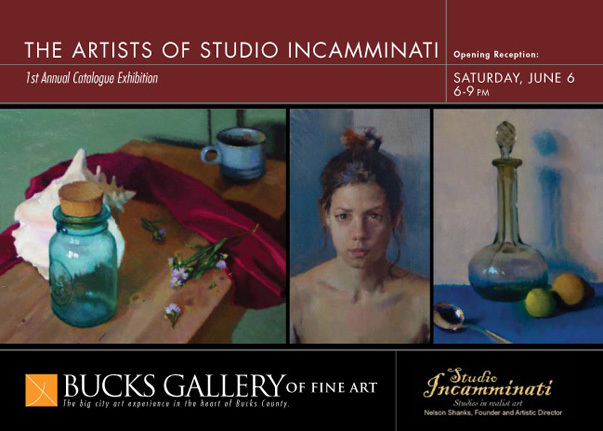 The Bucks Gallery of Fine Art is in Newtown, PA. We are not to be confused with any other gallery that bears a similar name and which is not a satellite gallery of ours. To our clients and friends for whom this has caused great confusion we offer our apologies.